[S66] Biographical Memoirs of Greene County, Ind: With Reminiscences of Pioneer Days, Volume 2, B. F. Bowen, (B.F. Bowen, 1908), 736-738, 1908. James Ritter, the grandfather of the subject [William Drayton Ritter] of this sketch was a native of North Carolina and a true type of the sterling pioneer. He married Violet Burcham, of that state, and they raised twelve children, Elizabeth, Violet, Polly, Moses, John, Isabelle, Sallie, Nancy, Laza­rus, James and Lewis. Moses Ritter, father of the sub­ject married Achsah O'Neil, of Newberry District, South Carolina. They lived in Surrey County, North Carolina. But tiring of his native community, Moses Ritter came to Washington county, Indiana, on foot and alone in 1817, where he remained four years, and in 1821 moved to Greene county, Indiana, where he procured a large tract of land. Being a carpenter and wagon maker, he fol­lowed his trade together with farming. He was given various commissions in the state by Governor Jennings and was a justice of the peace. In politics he was a Whig and later a Republican. Coming to Bloomfield in 1827 he entered government land, south of the city, and also worked at his trade. He was a Quaker and later a Methodist. He died in 1870, and his wife died in 1873. Moses Ritter's mother came to Indiana in 1823 and lived with her son Lewis, seventeen miles from Indianapolis, until her death. 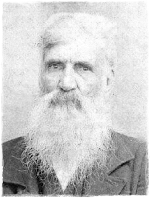 Lazarus lived and died in Greene county, Indiana; John lived in the same county, where he owned and conducted a mill, later going to Texas; Lewis lived near Indianapolis; Elizabeth lived and died in the north­ern part of Greene county; Isabella lived and died in Jas­per county, Illinois; Rosanna lived and died in Hendricks county, Illinois; Sallie lived in the same county; Violet lived and died in Greene county; Nancy and Polly lived and died in Morgan county, Indiana. Five children were born to Moses Ritter and wife, most of whom are still living. They are: Mary, who was the wife of William Mason; she lived and died in Richland township, Greene county, Indiana; Annie, wife of George Grismore, lives in Bloomfield, Indiana; William D., [the subject]; Eliza, the wife of William W. Gainey, retired merchant and post­master of Bloomfield; Emma is the widow of Henry Hill, who was an attorney of Bloomfield, where she still lives.